What is Oor Mad History? I remember sitting in an office in Deaconess House, with Brian Cavanagh, who was the chair of NHS Lothian, and he said that the crisis centre was the shibboleth of the user movement. I didn’t know what this word meant at the time but I knew it wasn’t a compliment. A shibboleth is a word or phrase that is used by a group to indicate who belongs to the group and who doesn’t. It implies that the phrase itself is almost meaningless apart from this purpose. So members of Edinburgh Users Forum and other groups were going about saying “we want a crisis centre” to show that we belonged and that we had no real idea of what a crisis centre was. That was not my experience. I remember going to meetings of what was then Lothian Users Forum in the mid 90s. People talked about all sorts of radical ideas such as advocacy and safe places to go when in crisis. We got individual advocacy pretty quickly, although Advocard was a small organisation only providing advocacy to the northeast sector of the city. But the crisis centre was another matter. I knew it was a radical idea when I first heard about it, but it also seemed to be just common sense. A safe, welcoming place for people to go when in crisis, where they would be treated with respect and without force. And that it was what they considered it a crisis, not what a worker said was a crisis. People talked about how it might mean they would not have to go into hospital, voluntarily or sectioned. How it might mean they would be able to sort out what was going on, whether emotional or practical or both, to enable them to get back on an even keel. How it might mean that the crisis would be dealt with quickly instead of spending weeks and months on an acute ward. Why did people feel the need for a crisis centre? In the interviews we did for Oor Mad History, people told us that they felt that they weren’t treated well in psychiatric hospitals, they felt disrespected and unheard, that the professionals were only interested in symptoms and medication, and that they had no say in what happened to them. As well, most community based services ran 9-5, Monday to Friday - which is not when most people have crises. What happens at 9 on a Saturday night or 4 on a Wednesday morning? There were no Intensive Home Treatment Teams then. So the campaign began... when exactly it started is hard to estimate. Those of you who knew Tom Carey might think it began in 1911 or even earlier - I used to be annoyed by his exaggeration but I am a bit pedantic. I think now that he was trying to express the frustration of all the years of campaigning, and all the obstacles that were put in our way. It might not have been 100 years but it felt like it! But one of the earlier milestones of the campaign was research which was written up in a report called Research into Mental Health Crisis Services in Lothian - in 1995! Yet it took till 2007 for the crisis services to start. 17 years. I can’t now remember all the twists in the tale, but at one stage, the social work department had the money but NHS Lothian didn’t, and at another stage, it was the other way around. I remember working groups and steering groups. I remember people going on visits down to England to see how crisis services were run down there. I remember people studying a report called Being there in a crisis to learn what worked down in England. However, the main problem from our perspective seemed to be the psychiatric profession. Not all of them but enough to make it difficult for us and our allies in the NHS and in the social work department. Someone overheard the head of a mental health service provider saying something similar - that their organisation would not be interested in being involved because it would all go wrong when one of us attacked another service user or a worker. At one stage, we were told there was funding for a telephone line and that we should take that and then see about a centre. We refused. A place for people to go to during a crisis was central to what we wanted. A phone line was not enough. We campaigned during the local elections in the early 2000s - ‘we’re mad as hell and we’re not going to take it any more’. We had Councillor Kingsley Thomas, then chair of the health and social care committee, along to EUF meetings where we told him what we wanted and why. It was around then that we met Brian Cavanagh. The message we were being told was that they didn’t want to invest in “bricks and mortar”. In other words, no crisis centre. But there were still battles to win - the planning committee refused permission for the lift which would have made most of the building inaccessible. But that was overturned under the Disability Discrimination Act. How much would the early campaigners recognise their dreams in this building and in this service, I don’t know. But when I hear someone say they had good support from the crisis centre the last time things got bad for them, I feel we have all achieved something good. To explain what this means in practice, someone who has used the Crisis Centre has asked me to read this to you. ‘I think from my personal experience a short time ago when I used the Crisis Centre and stayed overnight, that it is an excellent service. Not only are the staff in my opinion very very good, they are excellent at communicating. I think the fact that the only ‘instrument’ they can ‘use’ is to talk, which users find invaluable. However some professionals doubt this, they think it is a weakness that the Crisis Centre cannot prescribe drugs (though, of course, you can take your normal medication) and that it can be ‘risky’, I think this is its greatest strength. For example I was at the stage where I would probably have been sectioned and I know that in the Royal Edinburgh Hospital I would I would have been specially medicated. On the whole I would be only spoken to if I hassled the nurses or if I went to the duty-room with a specific request of the nurses, thus is the reality of the NHS; whereas in the Crisis Centre the staff stayed with me at all times and we talked until two o’clock in the morning. The next day I felt really able to face the world again and was very grateful to the staff. Also the building was extremely good, I had my own room, that has happened rarely at the Royal Edinburgh Hospital, and it was noticeable clean’. Eileen, one of Oor Mad History's volunteers, has written a review of Upstairs in the Crazy House by Pat Capponi. “Upstairs in the Crazy House” is an inspirational autobiography written by a service user and mental health advocate of the Canadian Psychiatric system, Pat Capponi. Pat gives a graphic and moving account of the unbelievable poverty and conditions endured by mental health service users. In tandem with this Pat also narrates her experiences as a victim of appalling child abuse who subsequently finds it difficult to fit in to “normal” life. With a failed marriage and career behind her Pat finds herself discharged from a psychiatric hospital to a half-way boarding house where her empathy and compassion for the boarders saves her from suicidal thoughts, putting her energy into protecting service users rights, advocating for improved housing as well as fighting for changes at government level on mental health policy. Pat went on to serve on many committees and continues the fight for service users rights. If you have seen Working Like Crazy, you will have seen Pat in her trademark cowboy hat. When David and Kathryn visited us in April, David gave us a copy of this book, her first. She has gone on to write many more books, including crime novels, and continues to be an activist in anti-poverty work. Phew! What a busy couple of weeks we have had. David Reville and Kathryn Church visited us from Toronto. They are both lecturers in the School of Disability Studies at Ryerson University. Since Working Like Crazy came to the UK in 2001, CAPS and EUF have kept in touch with what is happening in Toronto. 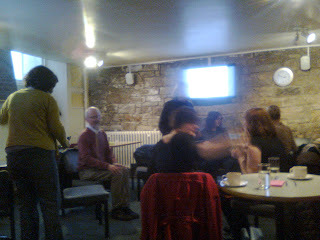 When David visited Edinburgh in 2007, we asked him to talk about his course Mad People's History because we had been thinking about how we remembered our own history. It was great to hear about his course and about the Psychiatric Survivors' Archive Toronto. This visit, David gave a talk called Working with Mental Illness. How people with mental health problems are denied opportunities for meaningful work, using his own story to illustrate his points. On Saturday, David, Kathryn, OMH and some Edinburgh people met with two academics from the University of Central Lancaster in Preston. Helen Spandler teaches on social work courses and Mick McKeown teaches on nursing courses. Mick also works with Comensus involving service users, carers and the wider community in the training and development of health and social care students. Helen is on the editorial group of Asylum magazine and also works with Survivor History Group. And now we are busy thinking up ideas of what to do for the Scottish Mental Health Arts and Film Festival and for UK Disability History Month. Busy, busy, busy! Oor Mad History - what next? We had a great afternoon today, talking about Oor Mad History. Kirsten reminded us of everything we've done since we first got started in the summer of 2008 and then we talked about what we want to do next. 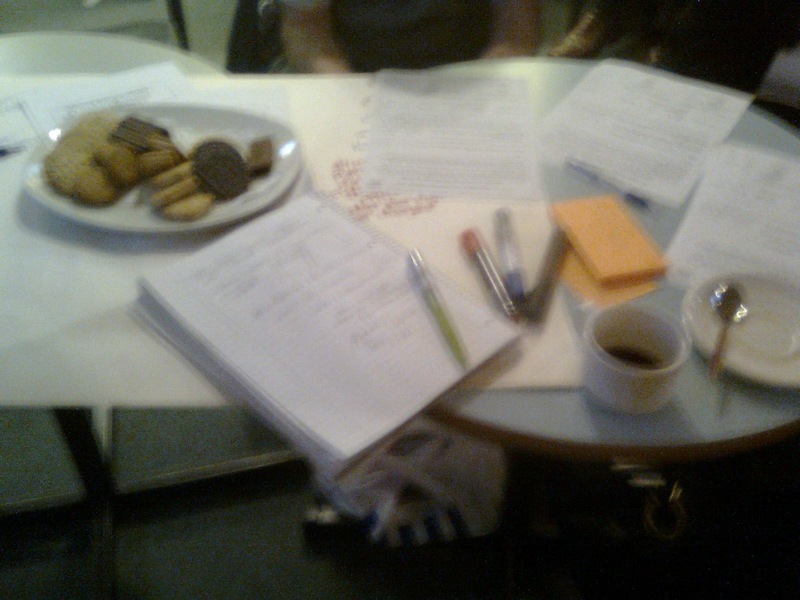 We came up with lots of ideas, most of which involved humour and creativity and how Oor Mad History can challenge stigma and outdated ideas about mad people. So now we need to go through all the post-it notes and flip chart sheets and see what we can do. Thanks to everyone who came today and to everyone who has been involved over the past few years. Onwards and upwards!